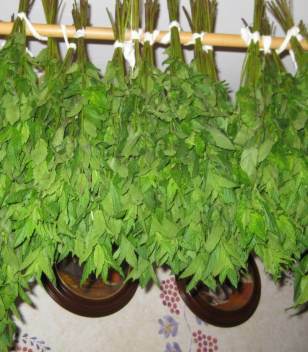 Recently I picked over 400 mint stalks to dry. The only reason I know how many I picked is because I bundled them in groups of 12. I was hoping to harvest what would be considered a lot, and it felt like I picked a lot, and washed a lot, and bundled a lot to dry. However, below is a photograph of my mint bed and you can see where I harvested mint and I have a lot left, but we won't talk about that. Normally I dry mint in an electric food dehydrator on its lowest temperature, or under 100 degrees F., but my dehydrator cannot hold over 400 stalks of mint. This time, I hung them to dry. Before I tell about that, I should mention that I washed the mint outside in a large tub. It wasn't really a tub, it was a very large storage container that I bought not for washing mint. The sides bulged out when it was filled with water but it worked. I was most interested in washing off all of the oak tree pollen that might be on the mint. I think that was accomplished. 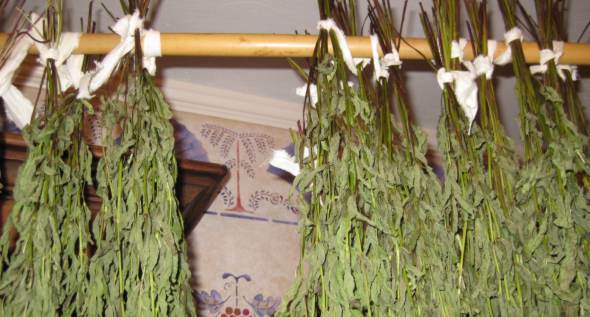 A little while later inside the house, I bundled the mint stalks into groups of twelve with strips of muslin fabric and hung the groups on an eight foot long bamboo pole that seems to always be somewhere in my house. I propped the pole on tall furniture to keep my cat out of it. Two days later most of it was dry. It took 4 or 5 days for all of it to dry. When your mint is dry, take one stalk at a time and run it through your fingers over a large bowl. The leaves will drop off into the bowl. 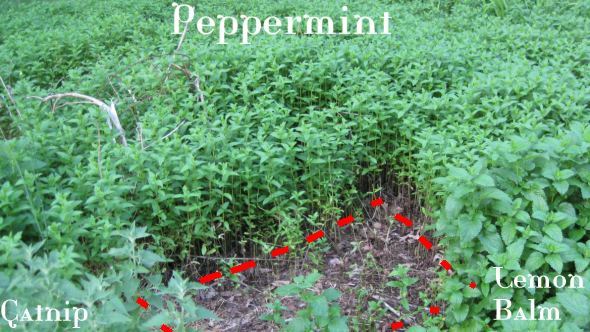 If the leaves do not drop easily off of the stalks, then the mint is not yet dry enough. Once all of the stalks are stripped, place the dried mint leaves in air tight containers. If you prefer, and I sometimes do for mint, crush your dry mint leaves by hand before placing them in jar. While crushing the mint, inspect it, removing parts that do not want to keep, such as stem pieces. Some say that herbs retain their flavor best when stored whole, but I've not noticed any reduction of quality with mint [specifically mint] by crushing them first. I tend to store other herbs whole but only because I do not dry such a great quantity of of the other herbs. 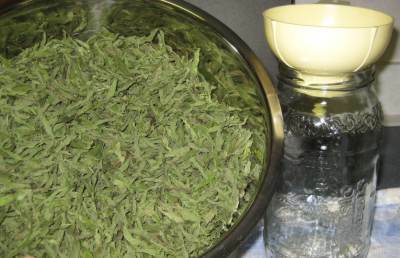 Crushing the dried mint is merely done to reduce storage space. Today's harvest of over 400 stalks yielded 4.2 ounces of dried mint. Crushed, that measured at 6 1/2 cups, whole would have measured around 17-18 cups. Ideally, store herbs in dark glass containers, but if you do not have dark glass containers, keep them in a dark cupboard. I usually have one jar of mint out for tea at all times. I covered this jar, the one that is kept out, with aluminum foil and packing tape. The foil blocks the light and the packing tape makes the foil covering durable. For mint tea, I fill a tea ball, the spring clamp type half full (probably a tablespoon) of crushed mint leaves. I pour boiling water over the filled tea ball and let it sit in the mug, a large mug, for a few minutes before drinking. Just a note here to say that my mug is large, probably 50% larger than a normal mug, so if you use a normal mug, use around 2 teaspoons of crushed mint leaves.